Key words: spatial planning, regional development, the roles of cities and territorial cohesion. Figure 1: After the structural reform in Denmark the 12 regions will be reduced to 5 which mainly will have the responsibility for hospitals – but also will make regional development plans on an overall level. The structural reform in Denmark creates new and very large changes in the public sector. The reform gives more power to the municipalities, and it gives less to the regions and more to the national level. The existing “amter” (regions) will be deleted and 5 new regions will be created. The existing number of municipalities will be reduced to the around 105 municipalities based on voluntary suggestions from the municipalities. This process can be seen as an symptom of the fact, that the municipalities are aware that to keep up in the competition, and their own development, they must “be bigger” and more powerful. The new regions will be responsible for hospitals and will not have the responsibility for nature and protection of land as they have had before. Before the regions (amter) made “region planer” which was more area based regulation of land, and the responsibility of this part of the planning process is now, with the new reform, being giving to the larger and more powerful municipalities. This paper will focus only of the new task being giving to the new regions in spatial planning. The new regions shall make “regional development plans” based on visions and strategies, based on business considerations, and the integration of rural and urban development will be a key factor in the perspective. The regions shall develop this new type of planning instrument in the Danish planning system, which will be a focal point in the new regions and their role as dynamos for regional development. The new strategic plan will cover general and overall aspects of relevance to the regions development, and it will be a base or inspiration and being a new umbrella for “development initiatives” in the region. Figure 2: Just to give an idea of the intentions. The regional development plan must have vision with a clear territorial focus showing overall planning directions. It is central that the regional development plans must show a complete vision for the development in the region on a number of areas such as nature, environment, tourism, employment, education, culture. Also the development in the peripheral areas and rural areas must be taken into account in the region. It is required that the regional development plans have a figure - or map - showing a “future picture” of the development in the region. The map will not have legally binding commitments, but it will be an illustration of the wished future development in the region, that the municipalities shall follow in their own planning. How detailed the signatures in the map will be can not the given before hand, but the signature will bee close connected to the content of the development plan. The signature shall illustrate, where the regional council foresees a future development, which is suggested developed. The signatures can show urban development, and as part of this housing and business development, different recreation uses and infrastructure etc. The signature is overall and broad and shows not a precise area or land. The main function of the maps is to show, where the development plan point on a wished development, but the regional council can not make objections to the plans in the municipalities with the maps as the only argument. If the map for instance show a “focus area” for future development of knowledge based businesses in one particularly part of the region, this does not mean that the regional development plan decides, where this type of business can be located or can not be located. It only shows that the regional council, after a dialog with the municipalities, the businesses and the knowledge institutions, have found that there is a certain base for the development of good framework conditions for that type of businesses in that areas. Therefore what is central when combining planning for urban and rural development is to have a vision for the development in the whole region. The vision must be drawn as a “future picture”, so that everyone can see, what is agreed on as a common role for the region. There also is a so-called development perspective in the new plans being presented in the parliament, which has the intention to integrate the funding and other kinds of implementation into the plans. The regional development plan will be based on regional business development strategies, which are made by new so-called “Vækstfora”, being a regional business agencies consisting of representatives from the region, the municipalities, the local businesses, the knowledge institutions and the labour organisations. There will be one or more if these in each region. The regional business development strategies will take their starting point in the main growth opportunities in the regions and the strengths and weaknesses in the regional business structure. In the agency the initiatives for future improvement of local growth opportunities is being developed and prioritised, and as part of this, also the development of the rural and more peripheral areas. The regional business agencies will also recommend to the state how to spend the use of EU structural funds. This possibility to integrate the structural funds also gives a other way to look at the rural areas, by incorporating the role of cities as a driving force in the regional development. This could give a larger focus on integrated urban and rural development, where for division of roles between cities and rural areas is put into focus. The moves made in Denmark goes towards more strategic planning, but it is also important to recognise that for many years, this have been a development, which has taken place also on EU level. The European ministers responsible for spatial planning meet in Rotterdam in November last year to informally discuss “territorial cohesion” and the new steps in their co-operation on spatial planing, which all in all show tendencies toward a more strategic planning. This angle will also be drawn into this paper. The informal cooperation between the EU ministers started in 1993, where it was decided to make an European spatial development perspective (European Spatial Development Perspective (ESDP)). The ESDP gave for the first time a ”strategic frame ” for a balanced and sustainable development in the EU and it gave three principles for the territorial development. First of all there should be a “polycentric development”, which meant a more decentralised growth and a development of the European territorial in other parts of areas than the main growth area around the cities in the central part of Europe. Secondly the ESDP asked for a greater amount of equality in the access to infrastructure, with a focus on local and regional accessibility to national and transnational infrastructure network. And as a third part the ESDP focuses on a reasonable administration of nature and cultural heritage, where these are monitored after common guidelines and at the same time viewed as regional development potentials. Since the countries in 1999 agreed on the ESDP the political context has changes dramatically. An important challenge is the proposed new EU treaty, where territorial cohesion as a goal on the same line as economic and social cohesion. The suggestion must be seen in close connection with the EU enlargement, meaning tremendous changes in the spatial and economic balance in the EU and in the balances in relation to the existing centre and periphery structure. These challenges makes it difficult to deal with the ambitions from the Lisbon strategy, about the EU being the worlds most dynamic and competitiveness knowledge based economy in year 2010. Therefore the Dutch presidency took the initiative to discuss the ESDP, and to analyse the territorial structure. The conclusions from Rotterdam can be argued to represent what could be seen as steps in the direction of a more strategic planning, as also seen in Denmark – aiming at integrating rural and urban development. The overall theme that was discussed in Rotterdam was “territorial cohesion”, and the message was that territorial imbalances and differences must be taking into account, on the same line as socio- and economic aspects as suggested in the EU Treaty. The most important conclusion in the meeting was that regions and member states must be aware of their development potentials and positions in Europe. This is necessary to meet the challenges on for instance a population that is getting older, about regional socio- and economical differences, certain problems in urban and rural areas, the increasing transport problem, the pressure on nature and cultural heritage etc. Luxembourg already has - by the way - said that the next informal ministers meeting will be June 2005. Here the ministers will discuss a short synthesis report, which will give a view of the ”territorial conditions of the union, and will be a common basis of inspiration for the future European work. The thoughts from Rotterdam is not unknown in Denmark, where we, through the work in the EU sub committee on ”Spatial and urban development”, been active in the preparation of the ministers meeting. 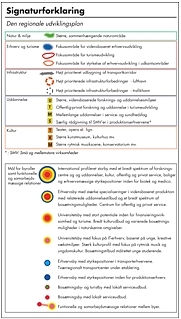 Also the most resent documents on national spatial planning policy in Denmark (“landsplanredegørelser”) have focused on the need and necessity of an integrated urban and regional development, building on the regions unique potentials and strengths. In Denmark there are already different regional corporations that today have reached territorial cohesion. There have been made different regional strategies in co-operation between municipalities that discuss the interrelation ship between cities and the surrounding rural areas. As well as the regions overall role on a national and international level. This is also being developed in so called ”dialogprojekter” – follow up projects on the national spatial planning report. 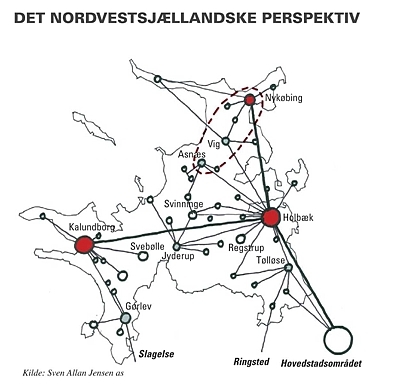 In these for instance the municipalities in NorthWest Sealand and North Jutland discusses their regional roles and possibilities in relation to the larger surrounding world. If the proposed regional development plan will be adopted in Parliament in the form that is known today, there lays good possibilities for the regional development plans to play further with the new European “planning tunes”. The regional development plans shall as mentioned in the beginning draw together the regional development strategies with education, employment, culture, nature and environment. This will give the possibility to use the regional development plan to co-ordinate the sectors with each other, with their plans geographically and regionally. The discussion about what should be the strategic focus in each region almost can not be taken with out also having a discussion on where the development should take place. In other words: “the future geographical profile” in different parts of the region, its cities, rural areas and peripheral areas. The regional development plan will not include a detailed regulation of land use. This is for the future taken care of in the municipality plan. It is there for too early to say, how detailed a geography and how much sector co-ordination the regional development plans will contain. On a national level it would be natural, that we in Denmark follow up on the recommendations from Rotterdam and creates clearer physical and functional strategies for whole Denmark, seen in a European and global setting. In the national spatial planning reports it has been underlined that each municipality and region organises it self in relation to the regional development. The national spatial planning policy has shown that there are different territorial connections in the country, which gives different territorial patterns and dynamisms. But a real territorial national strategy has not been the case. The message from the European minister is that the national policy also should contain some kind of spatial strategies. The thoughts on what one would like to do should not be thought without connection to an imagination about where one would like to do this. There should be some kind of a geographical profile in the national policies, which will be new for some of them. The meeting in Rotterdam was informal and could not take binding discussions. The Danish government is not obliged to follow the political directions. But the effort should on the other hand be tried, and the national planning policy document, which will be made in 2005, would be a natural place to start. The future regional development plans will be a central element of the regional input to the future national planning policy. The government will in its national planing policy put forward a vision for the country development and an overall decision on the development that will take place in different parts of the country. The national analysis and co-ordinated physical and functional problem areas can give a possibility to see the development in one region in close connection to what the sate it self wants to do. Depending on what the government want to do, the national planning document give the possibility for each region to see itself into a larger connection. The Danish case has shown new attempts for integrating spatial planning in urban and rural areas. It has also shown efforts in developing a more strategic planning where business and development perspectives plays a central role. What is important - is to have a common vision among the municipalities about the development of the whole region, and what this will mean for the development in different parts of the region. And also what is important is to have a possible combination with the economic funding, which gives the possibility to implement the plan. The move made in Denmark goes towards more a strategic planning, and this have been development, that has taken place also on EU level. The European ministers responsible for spatial planning meet in Rotterdam in November last year to informally discuss “territorial cohesion” and the new steps in their co-operation on spatial planning. This show also tendencies toward a more strategic planning. The conclusions from Rotterdam can be argued to represent an aiming of integrating rural and urban development. The overall message that was discussed in Rotterdam was that territorial imbalances and differences must be taking into account, on the same line as socio- and economic aspects. 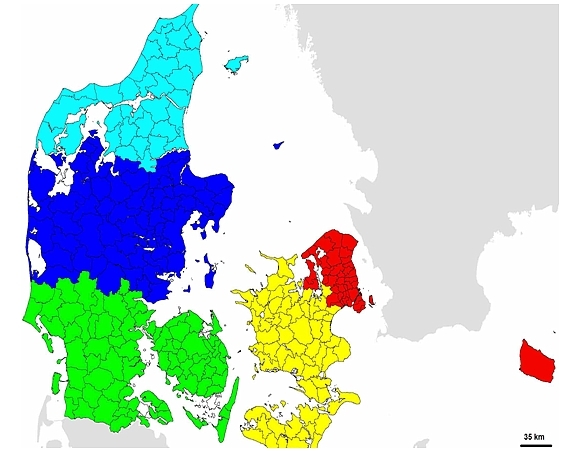 Territorial cohesion is not new in Denmark. On the regional level there have been made different regional strategies in co-operation between municipalities that discuss the interrelation ship between cities and the surrounding rural areas, as well as the regions overall role on a national and international level. This is also being developed in so-called ”dialogprojekter” – which is following up projects on the national spatial planning report. The new regional development plans shall now as mentioned in the beginning draw together the regional development strategies with education, employment, culture, nature and environment. This will give the possibility to use the regional development plan to co-ordinate the sectors with each other, with their plans geographically and in a regionally perspective. The discussion about what should be the strategic focus in each region almost can not be taken with out also having a discussion on where the development should take place. In other words: “the future geographical profile” in different parts of the region, its cities, rural areas and peripheral areas. On a national level the national spatial planning reports has underlined that each municipality and region organises it self in relation to the regional development. The national spatial planning policy has shown that there are different territorial connections in the country, which gives different territorial patterns and dynamisms. But a real territorial national strategy has not been the case. The government will - in its national planing policy - put forward a vision for the country development and an overall decision on the development that will take place in different parts of the country. Depending on what the government wants to do, the national planning document could give the possibility for each region, and the regional development plan, to see itself into a larger connection. Therefor much is still to be observed. 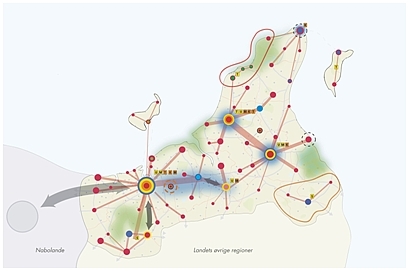 Never the less a shift in how to make good spatial planning has come to Denmark, introducing strategic elements on regional and municipality level. In a time where different sectors – transport, environment, nature ect. - increasingly uses planning methods in their own sector planning, the good old spatial planning has moved towards being much more integrated with business consideration and using scenarios in the development planning for the future. Mette Kragh is employed in the Danish Spatial Planning Department, tasks related to EU structural funds, Nordic regional policy and the Danish national spatial planning policy. She has also been employed in two Danish regions dealing with land use planning, management and administration. Member of the FIG Commission 8, Danish delegate.